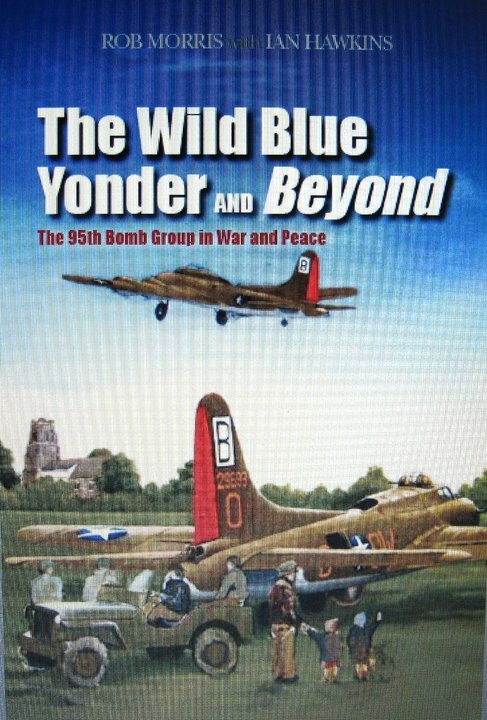 The new 95th Bomb Group history 'Into the Wild Blue Yonder and Beyond' is in its final publication stages with Potomac Books and will be released in 2011. 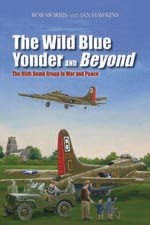 The book tells the story of the Bomb Group and its subsequent Foundation from its inception through the current day. Included are chapters on wives, POWs, ground crews, entertainment and London, the British, and much more. The book is arranged, for the most part, chronologically, except for specialty chapters such as wives or Entertainment. Lt. Keith Murray, missing in action. 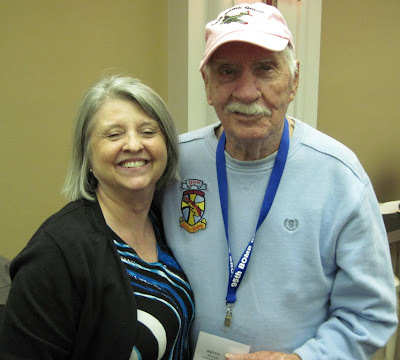 Keith walked over the Pyrenees Mountains to Spain in the fall of 1943. Of the twenty-odd men making the trek, only three survived. A photo of the young, handsome Keith Murray taken before shipping overseas. Keith Murray today. 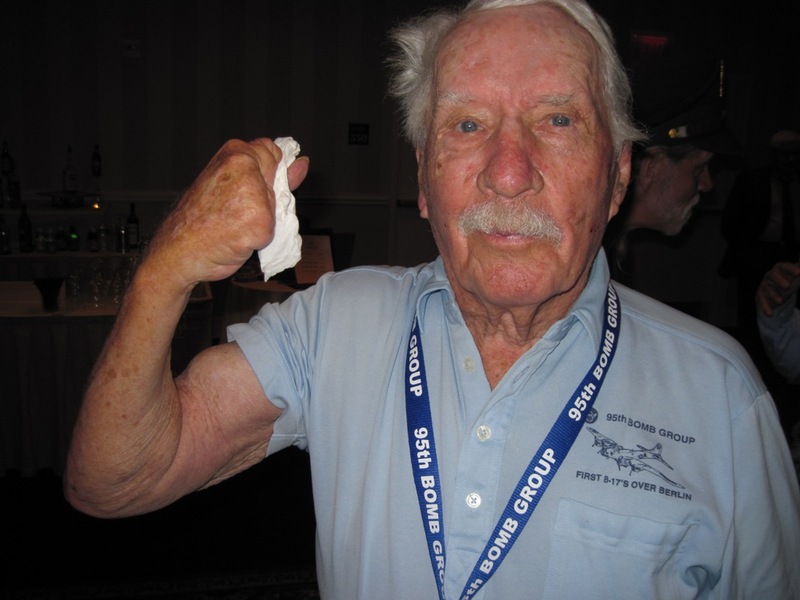 Bigger muscles than most twenty-year-olds, Keith pumps iron and plays golf despite having lost a number of his fingers: he plays with a left-handed club. Keith was one of the very first men in the original cadre of the 95th, joining the Group in its infancy in Spokane, Washington . 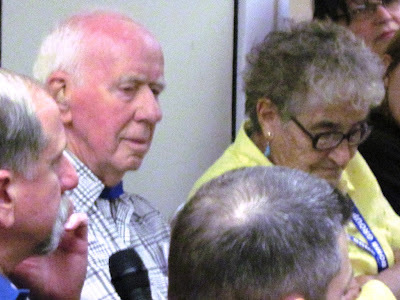 Charlie Besser and his wife were my tablemates at the final banquet. 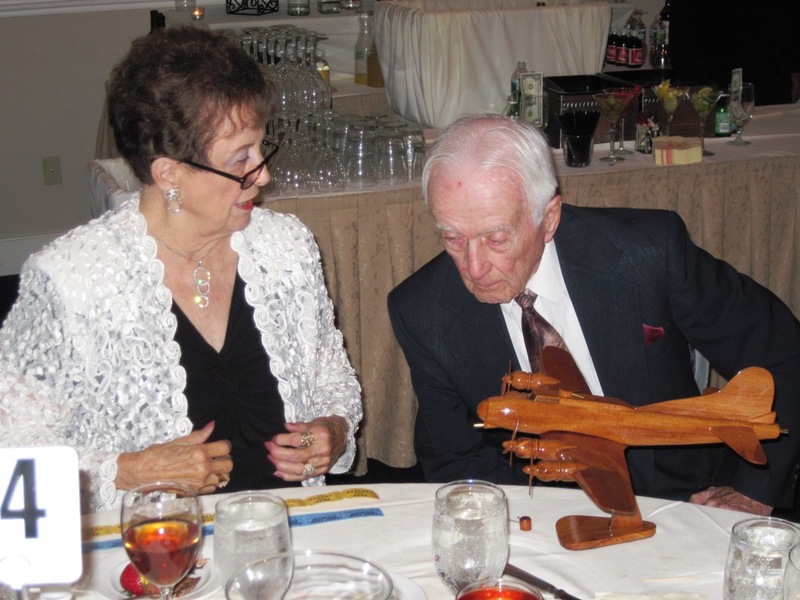 Charlie won this wooden B-17 model for being the oldest attending veteran at age 94. 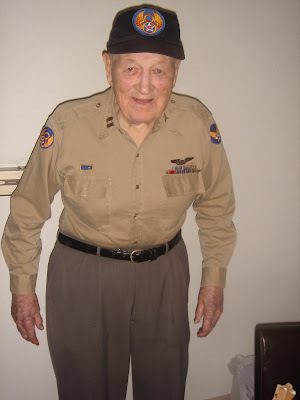 Charlie was one of the original cadre of the 95th, as was Keith Murray. Adam Hinojos and his family at the banquet. 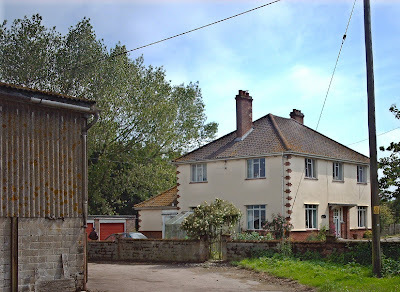 Adam spent the entire war at Horham as a member of the 457th Sub Depot. 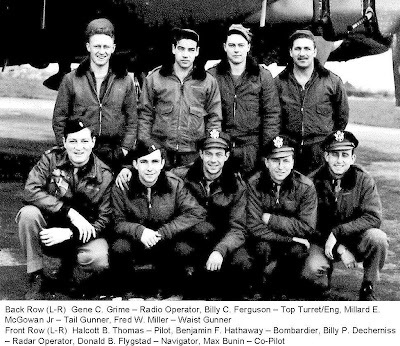 L-R: TT Gunner Irv Rothman (POW); Pilot John Walter; Bob Spinnenweber; Pilot Ed Jacobson; Bob Inman. Men whose crew position is not listed are those that I am unsure of. Top Row, L-R: Irv Rothman, John Walter, Bob Spinnenweber, Ed Jacobson, Bob Inman, Harry Hull, Jack Bertram. 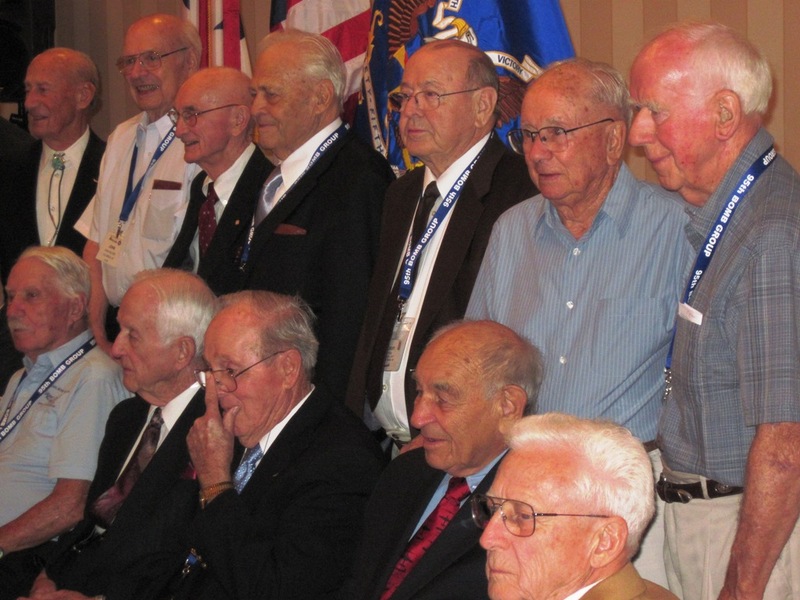 Bottom Row, L-R: Keith Murray, Charlie Besser, Fred Kennie, Herb Wilkov, Bob Fay. Rob Morris, Red Dillon and Paul Dillon. 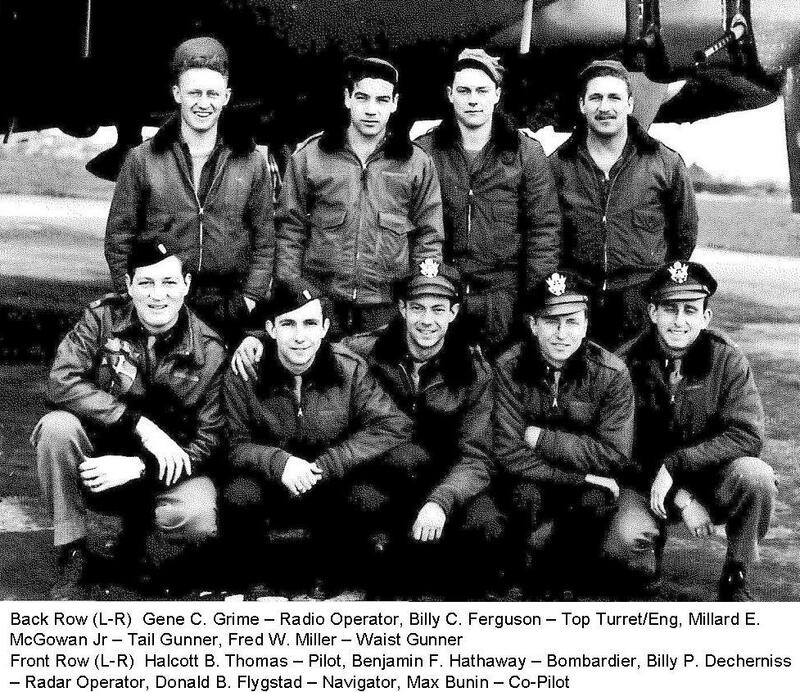 Red was shot down on the Broman Crew over Munster in October 1943 and became a POW. He is one of the top-scoring ball turret gunners of the European Theater. Paul is the illustrator of my new book on the 95th. Mary and Dub Vandergriff look at the 95th's plaque at the Tomb of the Unknown Soldier, Arlington National Cemetery. 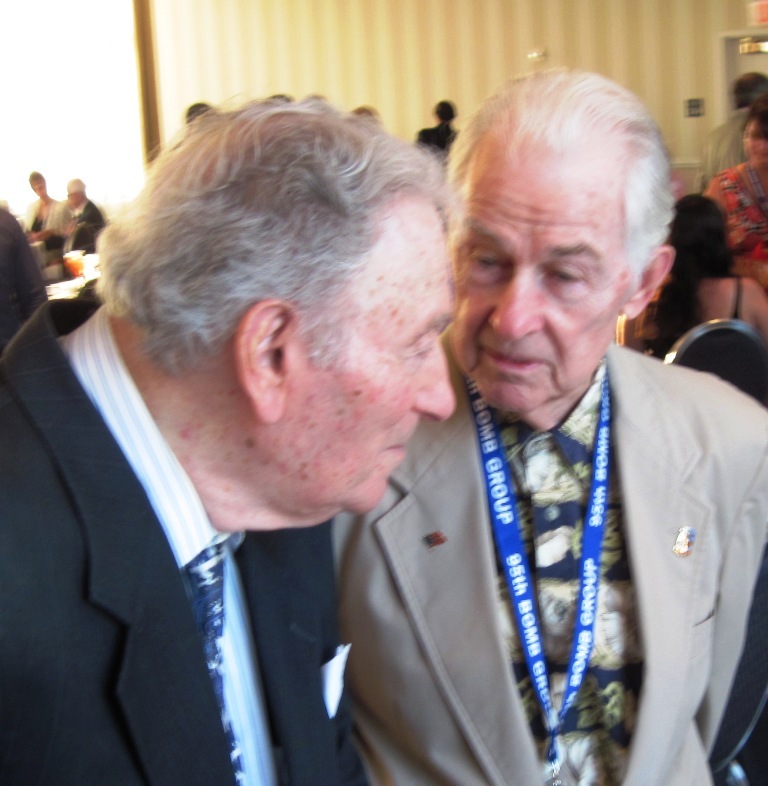 Ben 'Rojo' Rojanksy and Herb Wilkov confer. Herb Wilkov, a shot that captures his humanity and goodness. My dear friend pilot John Walter, who wrote 'My War' and who helped me write 'Into the Wild Blue. Jack Bertram, a quiet hero. 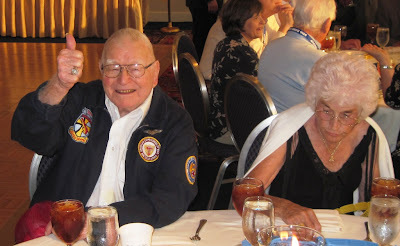 Ball turret gunner Bob Fay, a good friend and a great contributor to the unit history. Keith Murray and his daughter. Keith proves that real men wear pink. James Mutton presents Karl Voss with his old kit bag. Another wonderful reunion filled with stories, friendship, and history. 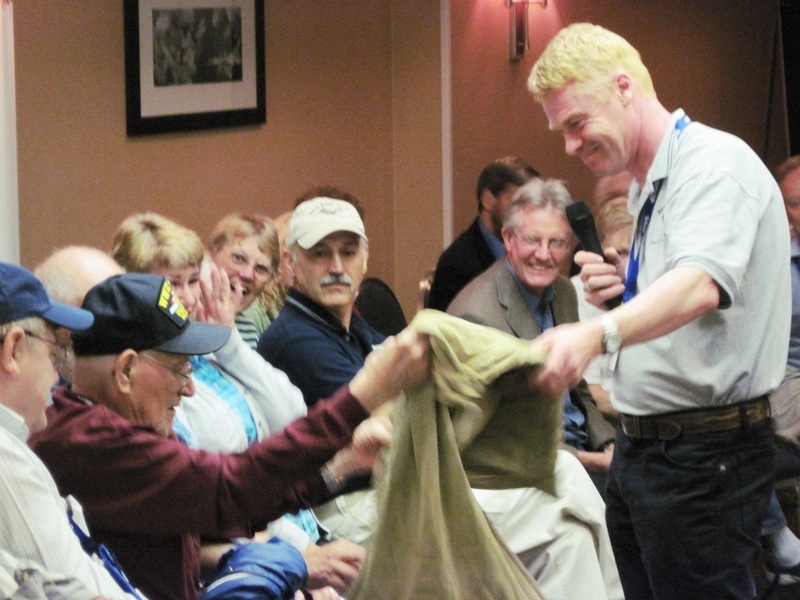 The 95th met at the end of August for its annual reunion. 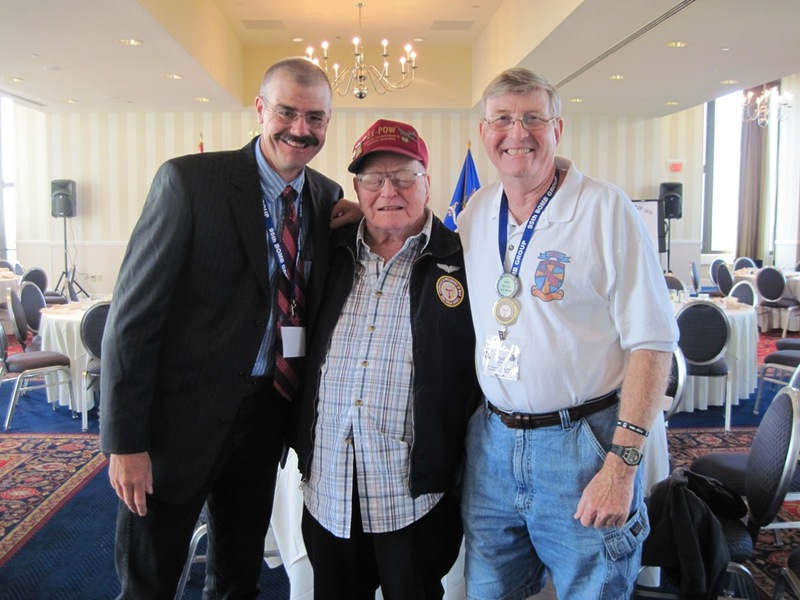 Around twenty veterans of the Group were in attendance, as well as many family members and friends. Here are some photos from the reunion. The Rongstad Crew. Front Row: Left to Right: 2nd Lt. Kenneth B. Rongstad of Montana, 2nd Lt. Warren M. Strawn, 2nd Lt. Richard E. Diete, 2nd Lt. Joseph F. Spicer. Back Row, Left to Right: S/Sgt. Gordon V. Sorensen, Sgt. Julius W. Torok, Sgt. Charles E. Phinney, Sgt. 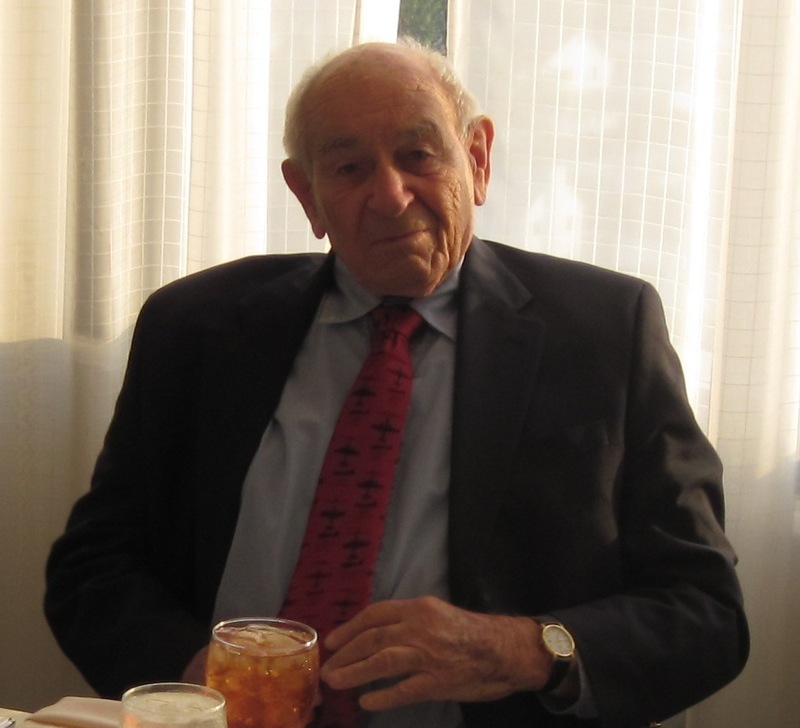 Louis M. Mirabel, Sgt. Aloysius L. Godek, S. Sgt. Agnew R. Eckert. Just received news from James Mutton in Suffolk that a crew photo of the ill-fated Rongstad crew has been donated by a neice of crewmen Warren Strawn. 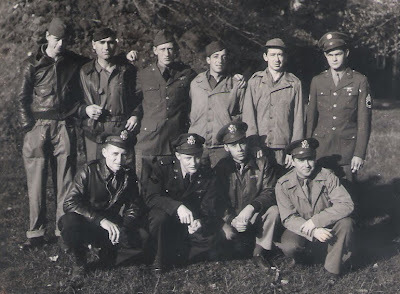 James has been looking for a photo of this crew for many years, as the crash of this crew was one of the things that drew him into his interest in the 95th Bomb Group and the air war in World War Two. Rongstad's B-17 crashed shortly after takeoff when it stalled in a banking turn. All the crew were killed in the accident. In June, a memorial was erected at the crash site. For more on the Rongstad crew, see the related stories on this blog by typing in "Rongstad" in the search box in upper left corner of blog. Marshall Dullum's crew in Korea. 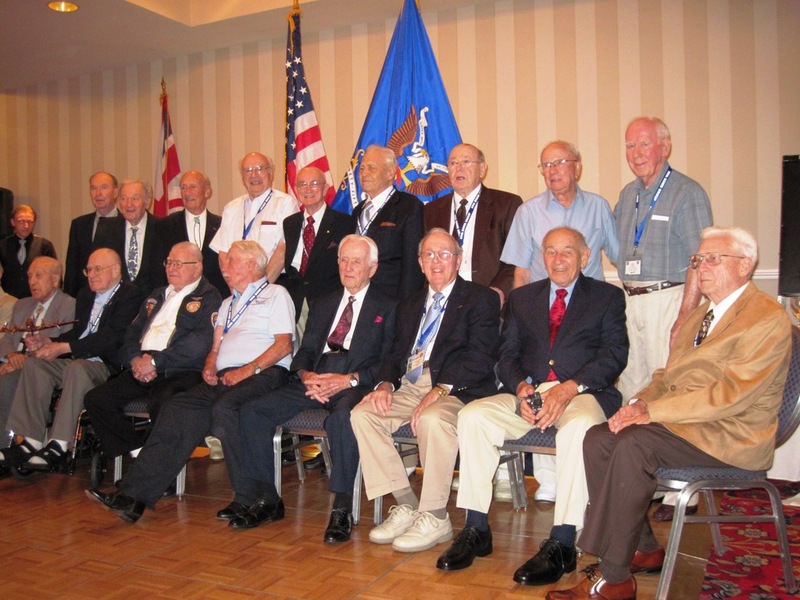 Marshall is front row, second from left. Marshall and Dean and a model of the B-29. 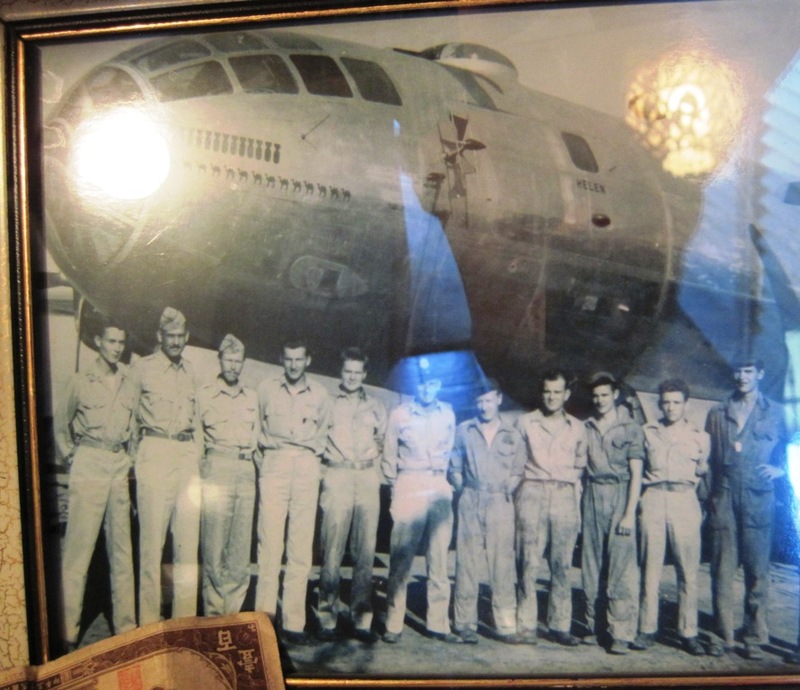 Marshall commented that if he and Dean could find two more old B-29 crewmen, they could form a new crew. 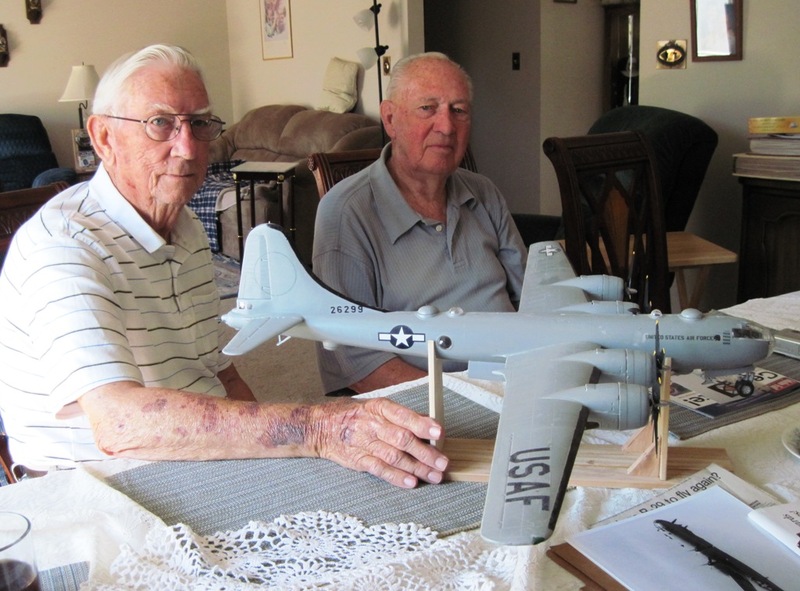 On August 13, 2010, two bomber boys who flew in the B-29 Superfortress met each other for the first time in Idaho Falls. I have known Marshall Dullum for three or four years, but only recently found out about Dean . 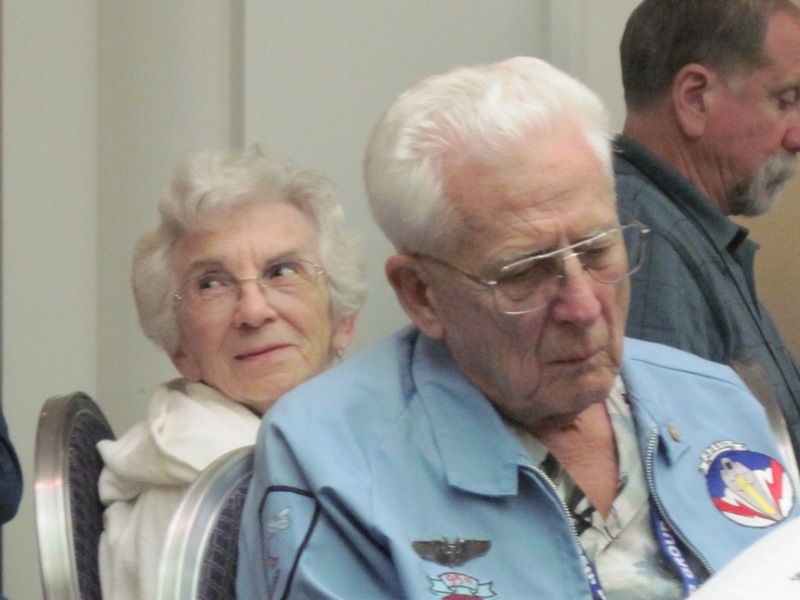 Marshall trained in bombers in WWII, but did not fly combat. He did, however, fly in the Berlin Airlift and in the United Nations peacekeeping action in the Middle East. He flew combat missions in a B-29 during the Korean War, near the end of the period when the 29 was used as a combat bomber. 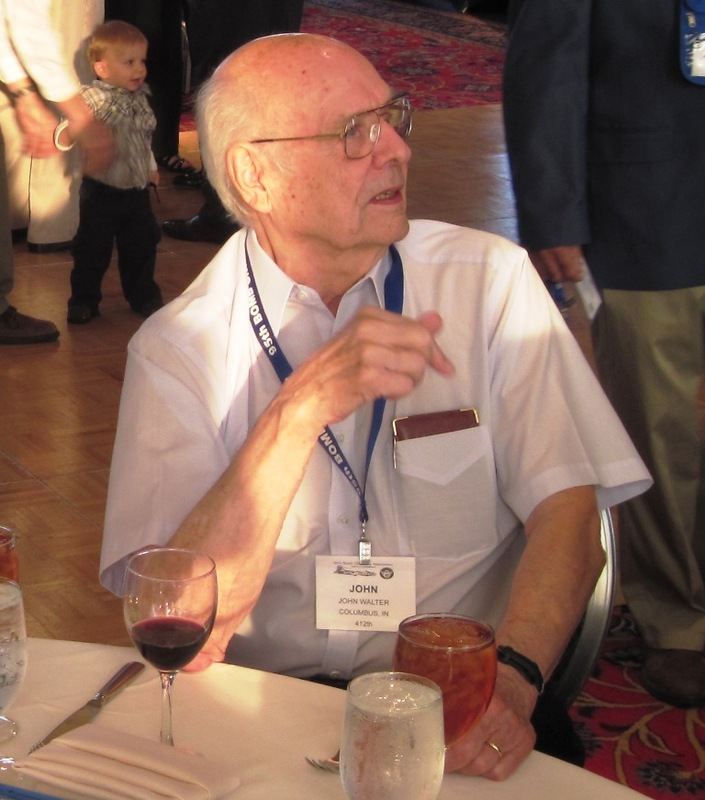 Dean flew in B-29s during WWII. 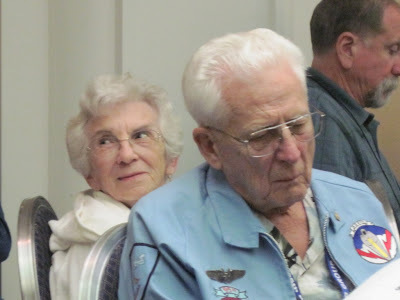 He first trained crews in 1942 and 1943 in B-17s and B-24s, and was one of the first to train in the new B-29, which he says is the best of the three by far. 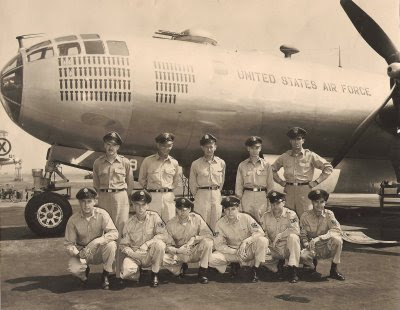 Dean flew with the 20th Air Force in Asia. 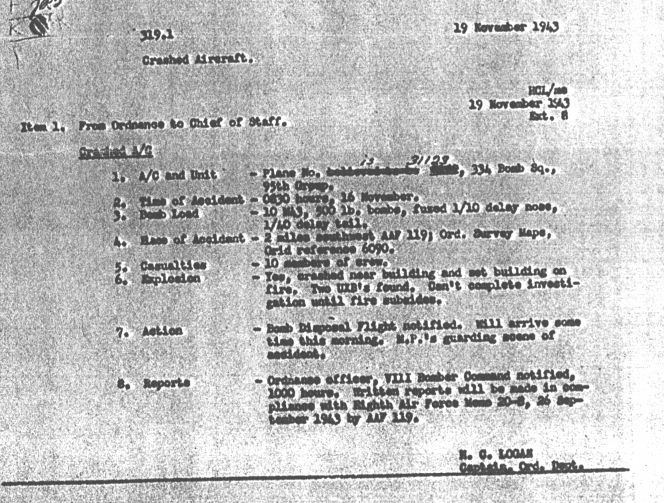 A flight engineer who had mechanical aptitude, he was responsible for keeping the mechanical components of the 29 working in flight. His crew "flew the Hump" over the Himalayas 25 times. The crew took off from a secret base in India, flew over the Himalayas--or, if the weather was good---through the Himalayas, threading its way between the jagged peaks. They landed at another secret base in China, and then took off to bomb Japanese-occupied areas in East Asia. Dean remembers that on a clear day you could navigate your way across the Himalayas by following the carcasses of crashed aircraft on the mountains below. 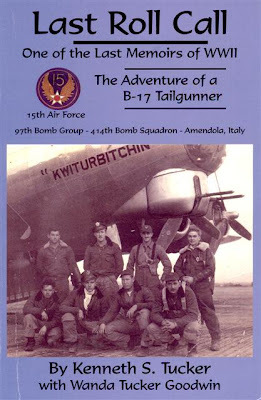 Book Review: 'Last Roll Call: The Adventures of a B-17 Tailgunner, 15th Air Force, 97th Bomb Group, Amendola Italy"
I had the good fortune recently to read a book by B-17 tailgunner Kenneth S. Tucker, who flew with the 97th Bomb Group in the 15th Air Force in World War Two. I also had the pleasure of communicating with his daughter, Wanda Tucker Goodwin, who helped her dad write the book. Though I've read literally hundreds of books about the air was in Europe, I was surprised at how much interesting information was in Mr. Tucker's book that I did not know about. 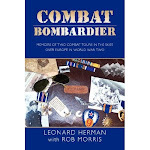 Most memoirs of the European air war are about the Eighth Air Force, which during and after the war garnered the lion's share of the publicity. A large part of this was simple proximity to those who reported the war. London was teeming with reporters looking for a good story, and the Eighth's bomber boys were only a few miles away. On the other hand, there were very few reporters willing or able to go to Amendola, Italy, and live in the alternately muddy and dusty tent cities there, surrounded by the crushing poverty of the Italian natives. Mr Tucker covers his life from his early days as a son of a fisherman in Florida, though his training, and into combat in the flak-filled skies over Europe. His writing is clear, unembellished, and honest. He develops the personalities of the various members of the crew as he recounts the missions, so that one feels like one knows the young men on the crew. He also tells of his visits to various places of interest on his time off, such as Pompeii and the Isle of Capri. 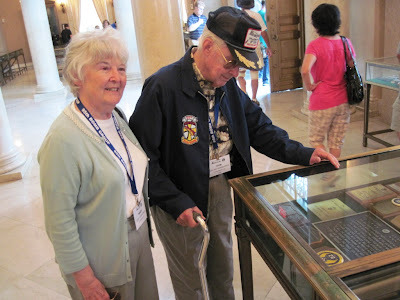 Many readers of WWII memoirs are on the lookout for signed memoirs. Here is your chance to pick one up. Follow the link below to Ken's website, and put in an order for a copy of this book. He'll personalize it and autograph it. 186 pages. Soft cover trade paperback. Illustrated with black and white photographs. Click link below or phone 850-624-8081. Yesterday, I heard from a friend who works at a nursing home in Los Angeles named Brad. 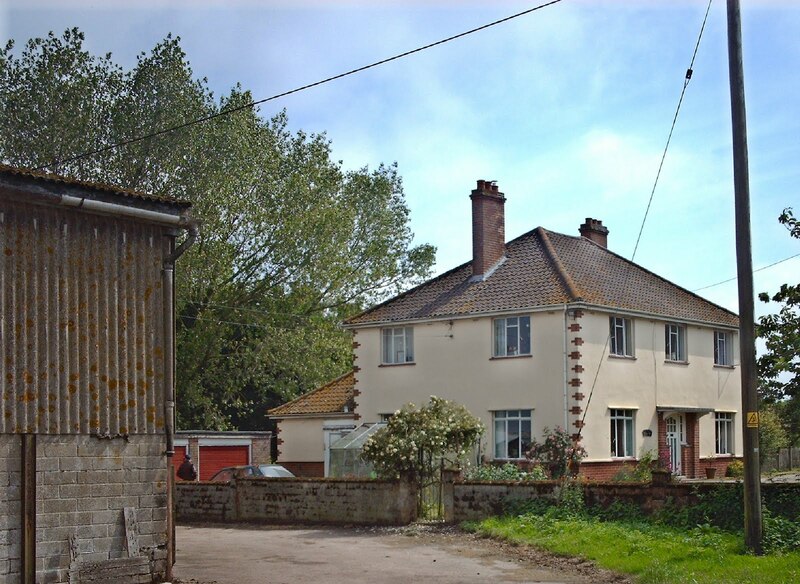 Brad has been keeping me posted on one of the residents at the home, a man by the name of Captain Halcott Thomas. Capt. Thomas flew with the 95th Bomb Group (H) in World War Two. That happens to be the Bomb Group about which I just finished writing a unit history. Yesterday, Brad told me that Captain Thomas had put on his uniform and gotten his materials together to give a talk about his experiences and nobody showed up to listen to him. This was in part due to a scheduling error, but it also struck me as symptomatic of our society's flawed values. We are willing to pay a lot of money to watch grown men dribble balls and hit balls with sticks, and we follow every move of people like Paris Hilton and other 'celebrities'. Now let me get this straight. We pay hundreds of millions to watch overpaid prima donnas but we aren't interested in seeing a real hero, one who helped assure our freedom sixty years ago at a time when the future of humanity literally hung in the balance. One Facebook comment that hit home came from Maria Eck Bullard, whose father, Harold Eck (still alive and in failing health) is a survivor of the U.S.S. Indianapolis sinking. Maria commented it was the saddest thing she'd heard in a long time. I agree. A lot of people have expressed interest in contacting Capt. Thomas to thank him for his service. This warms my heart, and it will warm Capt. Thomas's even more. But there are thousands of men and women just like Captain Thomas all over the United States. 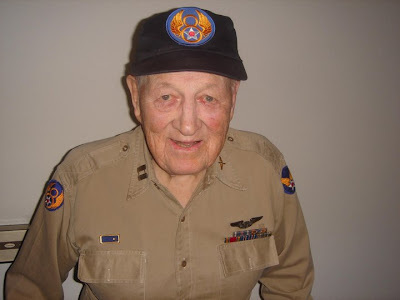 For example, right here in Idaho Falls, there is a gentleman in the Alzheimers unit at a nursing home who is a former P-51 Mustang pilot with 3.5 aerial victories over Germany with the 339th Fighter Group. I visited him a bit last summer and then got busy and haven't been back lately. I dropped the ball. I am pleased that the school where I work, Clair E. Gale Junior High, holds a Veteran's Day appreciation every year and invites as many local WWII vets as they can track down for a special lunch with the seventh grade students. The lady who coordinates this, Mrs. Pearson, also has the vets sitting at tables with kids who interview them. It is a fine time for all. Last school year, my 9th grade students corresponded with three Bataan Death March survivors. We did it as a supplementary activity, outside the curriculum, because of the comments from so many Bataan Death March suvivors I'd been interviewing for my Untold Valor: Pacific book that nobody knew anything about the March and that it was never taught in the history books any more. To my surprise, at the end of the school year, many of my students said this was their favorite thing that they learned all year. Why? Because history came alive for them. 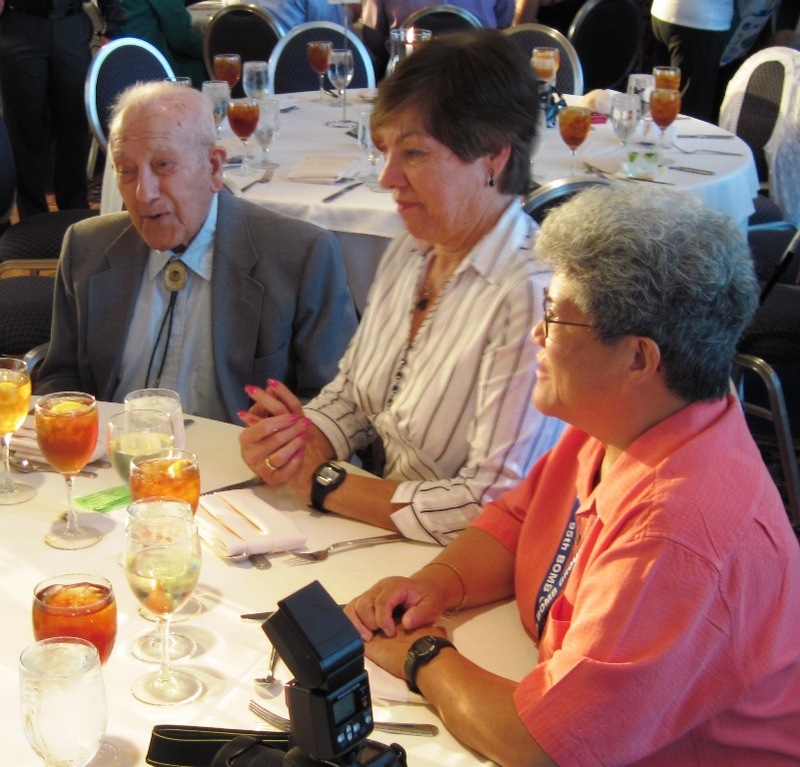 We need to recommit to honoring our WWII vets, because in another few years, they will all be gone. Call local nursing homes, or the local American Legion of VFW, and find out if there are vets in your area. In the past year, I have found right here in my small city, almost enough men to fill my Pacific book, including a Navy Cross-winning Okinawa Marine, another Marine who saw the flag go up on Iwo Jima, and many more. Now, back to Captain Thomas. Halcott Thomas was working on a degree in Engineering at the University of Southern California and was almost doen when Pearl Harbor was bombed December 7, 1941. 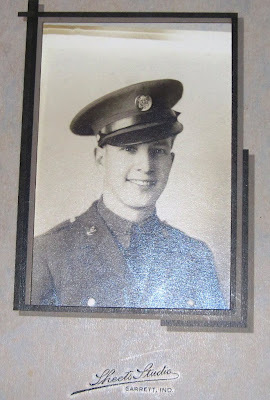 "I decided to join the Army Air Corps," he told me in an interview July 2, 2010. "It took one and a half years in five different places to get to Dyersburg, Tennesse, where I got my whole crew. "Most of the crew had never been in a B-17 Flying Fortress. This included my copilot. We spent a whole month at Dyersburg learning to take off and fly in a 36-plane formation, which is what we'd be using when we got to Europe. A lot of the other pilots didn't let their copilots fly much during this time, as the copilots had no experience. I took the opposite view. I let my copilot do three-fourths of the flying and then he was ready to roll." After training, we flew to Goose Bay, Labrador. They showed us a movie taken from the nose of an aircraft that showed us how to locate the landing field in Greenland. We had to fly at low-altitude for seventy miles up a deep fjord. Eventually, we would see a three-masted schooner which had sunk in the middle of the fjord. There was a 12,000-foot mountain on the right side of the fjord. We were supposed to fly right between the masts and then we'd see the runway. "Instructions were very clear. You land. You don't try to go around. And by the way, the runway is three hundred feet higher at the top than at the bottom. And while you're at it, look out for that 12,000 mountain. "When we flew out of there, we took off, did a sharp turn, flew to the three-masted schooner and jumped out of the fjord. Our next stop was Ireland, and from there we went to England and were assigned to the 95th Bomb Group at Horham, England. 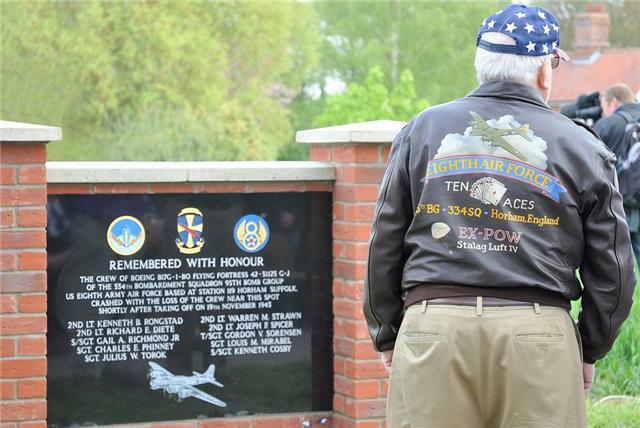 I flew thirty missions with the 95th Bomb Group. 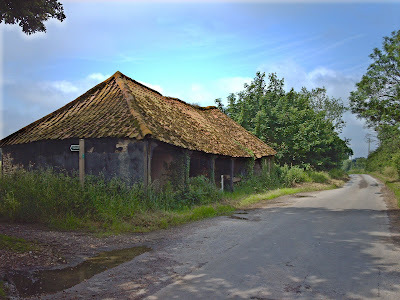 I remember in particular one mission, my third, where we dropped guns and ammunition at low altitude to the Polish Underground. They were literally underground and the Germans were almost right on top of them. After dropping off the weapons, we flew on to Russia. "This Russia mission had been planned for some time. 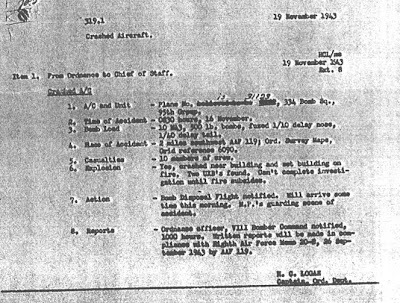 Three times we went to briefings and were then told the mission was called off, because they had been unable to get Stalin to agree to let us land. It was a huge operation. All the materials and supplies we'd need when we landed in Russia had to be trucked in from the south before we arrived in a big convoy. Finally, we got clearance from Stalin and flew the mission." (After the war, a diplomat from the Polish Embassy tracked down Thomas and awarded him with a medal for helping to resupply the Polish Underground in its time of need). Captain Thomas is doing a more extensive record for me, but this was from our conversation last night. It is an honor to thank this American hero. 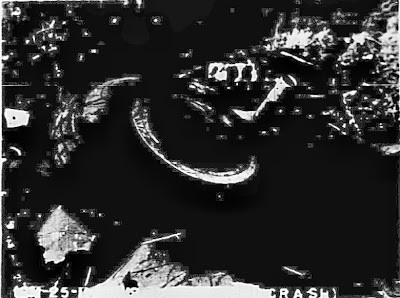 Official Army crash photos taken after the crash. 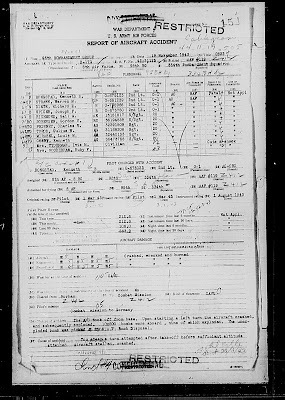 Green Farm Accident Report, 95th Bomb Group Archives. Lt. Rongstad's obituary in the Daily Interlake, Kalispell, Montana. Green Farm burns after the B-17 crashed next to it. 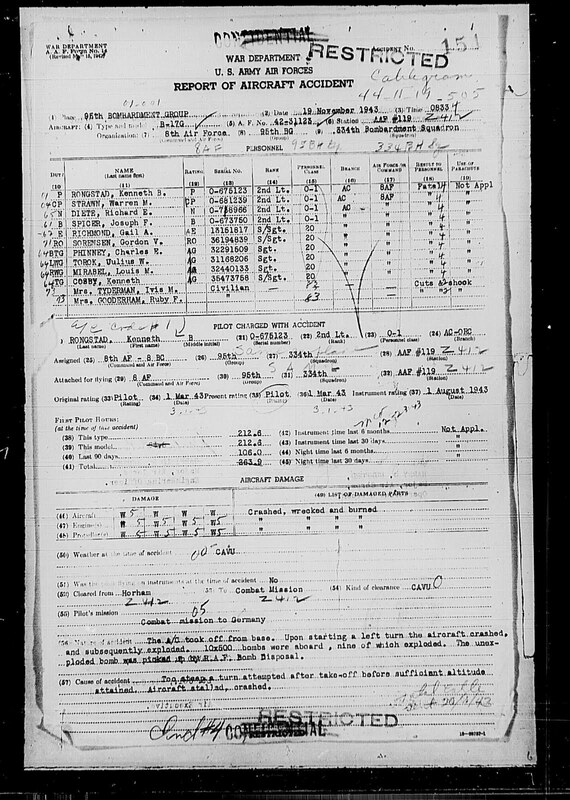 The Rongstad crew perished in a fiery crash after taking off from Horham on November 19, 1943. 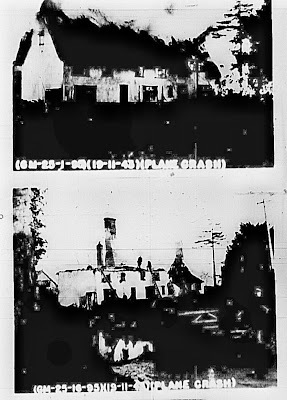 The pilot, fellow Montanan Kenneth Rongstad of Kalispell, banked his B-17 sharply after takeoff, the aircraft stalled, and it plunged to the ground, narrowly missing the Green Farm farmhouse, setting the farm house and another across the lane on fire. 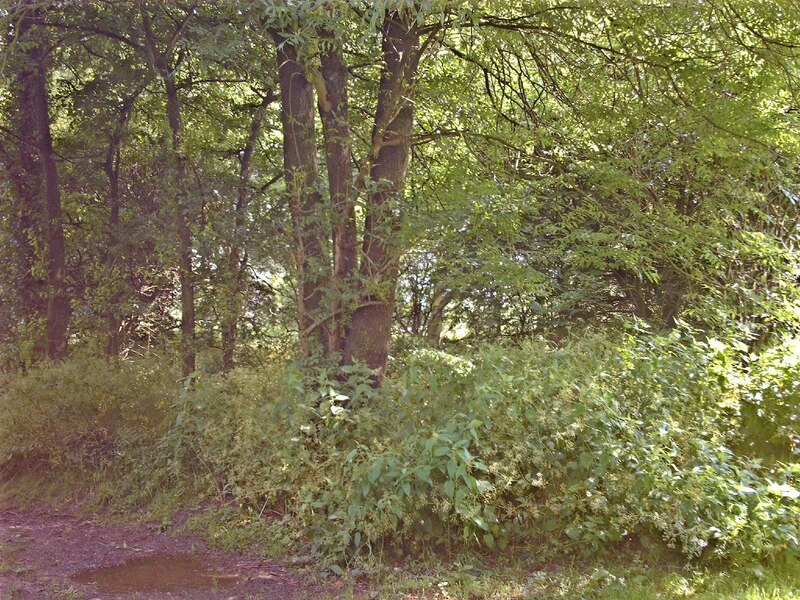 The men who possibly survived the initial crash were killed when the ordnance went off. The photos of the memorial ceremony were taken by a friend of mine, professional photographer Richard Flagg, at Open Day yesterday, May 15, at Horham, Suffolk, England. My Untold Valor Book Website--Come on in and Take a Look!